Everyday Magic is a magic shop, crystal heaven, safe space, and retail experience offering intentionally made goods created by witchy makers around the world. 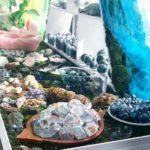 Carrying a selection of gemstones, books, tarot cards, candles, self-care and healing objects, our commitment is to beautiful, ethical, and mindfully made objects for your home, body and spirit. Founded in 2016, EM is owned and operated by Bakara Wintner and Christian Berry. Both hailing from chaotic environments, finding their way to magic and eventually, each other, they approach their work through the connecting lens of storytelling and the belief that healing the world begins on an individual level. But healing the whole world is, of course, the goal.